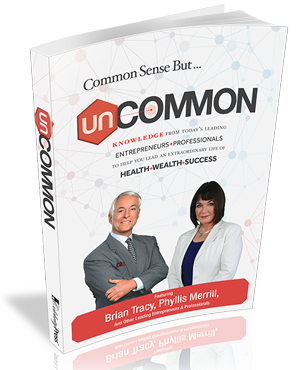 "Common Sense but UNCOMMON Knowledge from Today's Leading Entrepreneurs & Professionals to Help You Lead An Extraordinary Life of Health, Wealth & Success"
Combining Common Sense with Uncommon Knowledge has the potential to produce winners. While Common Sense has been noted to be in short supply and Uncommon Knowledge hard to come by, the Celebrity Experts® in this book have combined the two to produce high rates of success in their fields. If you are looking to accomplish personal, worthy goals, a helping hand will get you there faster. In addition, a mentor will invariably get you there at less cost than if you try to make your own way, helping you to avoid errors that may be time-consuming or costly, or both. Succeeding requires the attributes of hard work, sound planning, action and perseverance—while combining common sense and uncommon knowledge as a part of the process. Mother always wanted to start out early, leaving home while it was still dark. The sprinkling system just finished watering the fields when we arrived. It was a cold, wet morning, barely light, the sun just peeking over the horizon and there I was, a six-year old girl, sitting on an upside down bucket, picking green beans. The cold, wet vines in the early dawn always made my hands freeze. Phyllis is driven and energetic and brings a different type of intelligence to the challenges of health care insurance. She is passionate about bringing cost transparency to the payment of medical claims, empowering organizations and consumers to take control of their medical care, paying only fair and reasonable prices. Her experience allows her to clearly identify the egregious pricing tactics of hospitals and other providers. She is a strong and passionate advocate for bringing transparency to business owners and reducing employee benefit costs. Phyllis has spoken to thousands of healthcare and insurance professionals in an educational capacity and has been interviewed on major media outlets. She is a leading advocate of the various cost-containment strategies now available to organizations to gain control of their healthcare dollars and reduce the cost of providing benefits to their employees.